When wildfires rage, where do animals go? 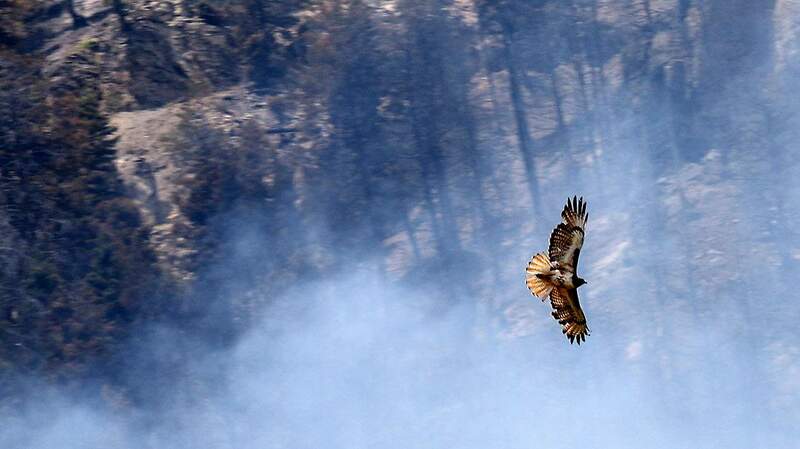 A hawk soars over the 416 Fire on June 4 west of U.S. Highway 550. Experts say wildlife populations know their escape routes when fire approaches, and research has shown that many animals can benefit from a fire’s subsequent impacts, such as a revitalized forest. Two uncontrolled wildfires are ripping across the San Juan National Forest in Southwest Colorado, forcing the evacuation of homes, shutting down the critical summer economy and putting firefighters at risk. For the animals that live in these forests, though displaced, the situation isn’t as grave as the ominous plume of smoke hovering near Durango suggests. 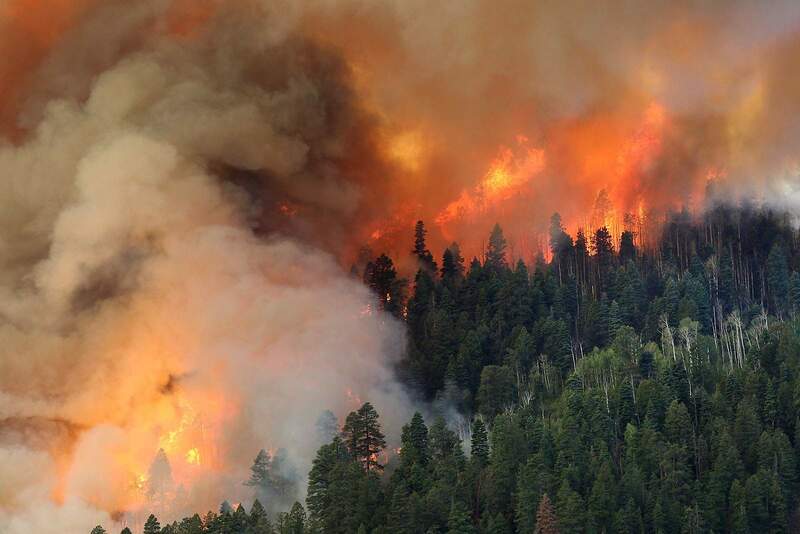 For almost two weeks, the 416 Fire has torched the forests north of Durango around Hermosa Creek, a remote and rugged region that was designated a wilderness area in 2014. The fire, which broke out June 1, had burned 32,959 acres as of Friday morning. Then, on June 8, another wildland fire broke out in the Bear Creek drainage in the La Plata Mountains in a steep spruce-fir forest. That blaze, called the Burro Fire, had consumed more than 3,400 acres as of Thursday night. Both fires are barely contained. 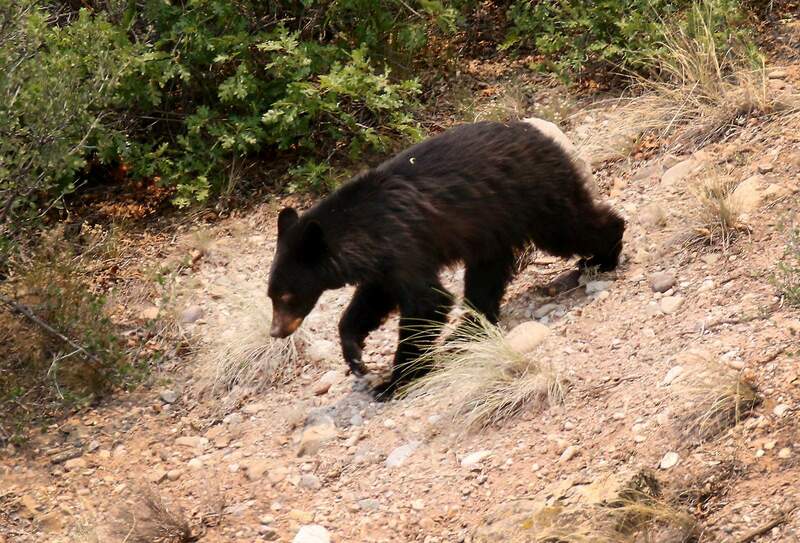 A black bear scurries down a hillside June 11 on the opposite side of Hermosa Creek from where a burnout operation was taking place south of County Road 202. Bears and other mammals, such as mountain lions, elk and deer, will retreat to other areas of the forest during a fire. Fire, of course, is a natural part of the landscape, and animals, plants, insects and other organisms have learned to deal with its effects. But with these two outbreaks, some have asked: When wildfires rage, where do the animals go? Ecologists and fire managers say the worry, though understandable, is unnecessary. Rare that wildlife dieThe U.S. Fish and Wildlife Service’s Gleason said research has shown that fire does not negatively affect wildlife populations and that many animals benefit from fire’s impacts. Animals have an innate ability to flee an approaching burn. Mammals, such as bears, mountain lions, elk and deer, will retreat to other areas of the forest. Predators have even been found to profit during fires by picking off other animals in flight. But not all species can take off for safer pastures. Amphibians and reptiles tend to hide in wet areas or burrow under logs and rocks. And birds, of course, can fly away. Because most wildlife can sense the threat of a fire even before humans, Gleason said it’s rare that wildlife die in fires. In fact, she said, in most cases, wildlife populations end up stronger after a blaze passes through. A post-fire survey of the 1988 Yellowstone fires, which burned almost 800,000 acres, found that only about 350 elk died out of the park’s estimated population of 50,000. In addition, the survey said only about 35 deer, six black bears, 12 moose, nine bison and one grizzly died. Animals that do die in fires, studies have shown, are usually caught up in fast-moving flames. In the Jemez Mountains in New Mexico, biologists thought that a rare species of salamander was wiped out after fires in 2001. To their surprise, researchers found the amphibian had survived and was actually thriving. Gleason said there’s never been a documented case of a wildfire knocking out an entire animal population or species. A rejuvenated landscapeThe public’s negative perception of fires stems from campaigns such as the anti-fire mascot Smokey Bear and movies like Disney’s “Bambi,” which shows the mule deer prince and his critter friends running in fear from a fire, Gleason said. These counterproductive sentiments have led to the over-suppression of fires, when in fact, a blaze in nearly all circumstances is a benefit to wildlife by increasing biodiversity and bolstering the health of the forest. The 416 Fire rages down a slope west of U.S. Highway 550 on June 1 at Shalona Hill. Wildfire can be the first step in rejuvenating landscapes, which will eventually benefit wildlife. Scott Wait, a senior terrestrial biologist for Colorado Parks and Wildlife, said that after a fire, rain stimulates significant growth of vegetation through flowering plants, grasses, aspen and oak brush, to name a few. “All of that fresh growth is highly nutritious and the benefits continue for years,” Wait said. 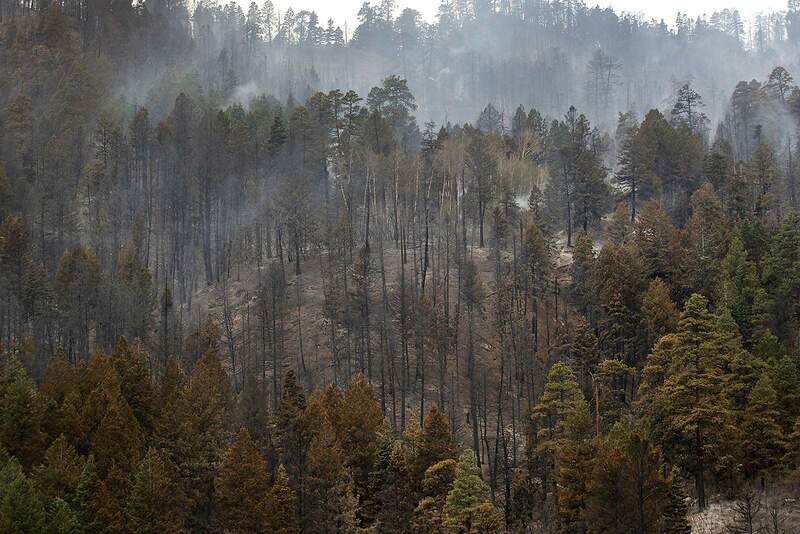 The Missionary Ridge Fire, which burned more than 70,000 acres north of Durango in 2002, wiped out old stands of conifers and eliminated the build-up of evergreen needles. In the fire’s wake, vegetation was rejuvenated. CPW spokesman Joe Lewandowski said that resulted in recovering populations of elk and deer. Concern for fishThe survival of fish, though, may be a different story. John Alves, senior aquatic biologist for CPW, said rains that come after fires can wash loose soil and ash into creeks, which can harm water quality and deplete oxygen for fish. The ash, too, can get into the gills of the fish and suffocate them, Alves said. Aquatic insects can also be smothered by sediment that washes into streams after soil has been damaged by a fire. The 416 Fire is burning just south of a significant project that restored miles of streams for native cutthroat trout. Lewandowski said CPW is closely monitoring this situation. High-intensity fireOne curveball is that fires are burning at an unprecedented intensity, which can cause burned areas to no longer support growth. Trees burned in the 416 Fire are seen June 2 on the west side of U.S. Highway 550. While wildfire can typically lead to the rejuvenation of landscapes, high-intensity fire can prevent the regrowth of vegetation. Before Western settlement, fires played an active role on the landscape, with slow-moving, low-intensity fires passing through every five to 20 years. As a result, vegetation was able to regenerate at a regular frequency. But with Western settlers came the doctrine to suppress every fire to protect homes and property. As a result, forests in the West are unnaturally dense and prime for high fire danger. Lou Ballard, a fire ecologist with the U.S. Fish and Wildlife Service, said this disruption in the natural fire cycle carries real concerns for the loss of habitat for wildlife.